Whether they’re shopping with Alicia Silverstone in Clueless, dancing with Julia Roberts in My Best Friend’s Wedding, impregnating Madonna in The Next Best Thing, or serving as Jennifer Aniston’s shoulder to cry on in The Object of My Affection, in the late 1990’s with Will & Grace's Debra Messing and Eric McCormack making their debut as television’s perfect couple combination, American straight women learned that while our heterosexual male counterparts are always unpredictable, a good loyal and loving gay best friend never goes out of style. However, leave it to Taxi Driver scribe Paul Schrader to find a new noir inspired approach to the cliché with the final installment of his “lonely man” trilogy, The Walker, which followed American Gigolo and the underrated, sharply executed Light Sleeper. Instead of simply being utilized to button hard to reach buttons, dish about Dior, or serve as a handsome stand-in when their husbands are out of town, the wealthy and witty Carter Page III (Woody Harrelson) who specializes in gossip but dabbles in real estate one day per week to have a day job finds his primary role as a “walker” (escorting the wealthy political wives from place to place in Washington D.C.) threatened after he helps his closest friend Lynn Lockner (Kristin Scott Thomas) escape the scene of a murder when she finds her lover stabbed. Fearing that the crime and evidence of her extramarital affair will destroy everything important to both herself and her husband, the Senate Minority Leader Larry Lockner (Willem Dafoe), Lynn and Carter flee. But when Carter returns to the apartment to look over everything himself and is spotted by a neighbor, he finds himself implicated in the crime as the top suspect in the ongoing investigation by power hungry Attorney General Mungo Tennant (William Hope) and Washington D.C. Detective Dixon (Geoff Francis), both of whom suspect that Lynn is somehow involved with the killing. Featuring superb, subtly drawn portrayals of neglected yet deceptively innocent Washington wives by veteran performers including Lily Tomlin and the legendary Lauren Bacall who gets the chance to say some of the film’s best lines, The Walker begins very strongly. 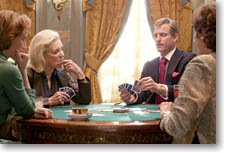 However, it seems to grow increasingly muddled as the film nears a conclusion and Schrader abandons his film noir roots and the lonely overtone that began the film in favor of attempting to make it a shrewd Washington D.C. scandalous political piece that never seems to come together in a way that pays off believably for the viewer. Despite this, it’s of particular interest not only to Schrader’s fans but especially those who are eager to explore Harrelson’s range as he begins the film in a slightly hammy Truman Capote styled manner that makes the overtly gay Carter seem a bit like a caricature before getting a unique and compelling handle on the man. Although ultimately there’s so much more to Carter than Schrader can incorporate into a regular feature length work as there’s some intriguing back story involving his father that was begging to be explored, Schrader really commands our interest in Harrelson’s scenes with the terrifically gifted supporting star Moritz Bleibtreu who plays Carter’s longsuffering Middle Eastern paparazzi photographer on-again/off-again boyfriend Emek Yoglu. While Light Sleeper still feels like the most successful work, minus that film’s obvious shortcomings, Schrader’s sophisticated if admittedly flawed Walker still feels far more intelligent and contemplative than other films in both the political and noir genres and reminds us once again of his outstanding flair for mature, nuanced, and complicated dialogue.